Whether you’re a military hobbyist or a gun enthusiast, tactical vests are probably the least of your considerations when choosing an accoutrement. But you’d be mistaken. Not only are tactical vests crucial for storing tools, ammunition, and accessories, they’re becoming a standard regulatory priority of many licensed shooting ranges. Tactical vests may have been initially designed for law enforcement and military professionals, but more and more civilians have come to realize just how necessary they really are. Both convenience, functionality, and comfort are critical when choosing the right one. But just like a firearm, they are not created equal. So how do you choose which one is right for you? Below you’ll find an overview of some of the best brands on the market, as well as a guide that will help you make the right decision. 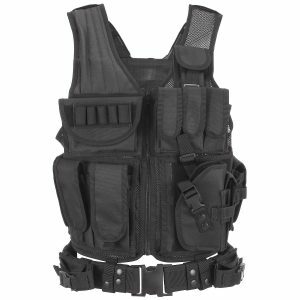 More lightweight than most other tactical vests at under 4 lbs, the UTG 547 boasts a rugged design, with a breathable mesh ventilation system and an adjustable position cross draw holster and attachable double-mag pouches. Even weight distribution is ensured by a heavy duty back loop system, while concealed zippers inside can accommodate additional ammunition, documents and other supplies. One of the more multi-faceted vests we’ve seen, with a pistol holster that fits most medium-framed pistols, three adjustable pistol mag pouches, three ammo pouches, a large shell pouch and a shooting pad. Made of durable nylon mesh for ventilation and adjustable shoulders, the rear of the vest allows for additional hydration bottles. A pistol belt is also included, and the interior contains two concealed zippers for additional storage. A durably crafted vest, made from a high-density solid mesh fabric. Adjustable waist straps ensure maximal comfort, while the front boasts three rifle magazine pouches, three small equipment pouches, a pistol holster and numerous utility pouches. There’s an interior mesh pocket for hydration packs, and both width and length are adjustable. An excellent choice for first-time buyers at an affordable price. Fitting most sizes from S to XXL, this vest also comes with adjustable shoulder and waist side straps. There are numerous utility pockets for storage, and a heavy duty back loop system is designed to carry additional gear and tools. Made of lightweight but durable polyester, this vest is mounted on nylon mesh to encourage optimal ventilation. 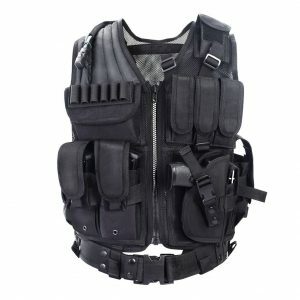 Tactical Vest Buying Guide – How to find the best tactical vest for your needs! While storage capacity is critical when choosing a tactical vest, its greater purpose is security. 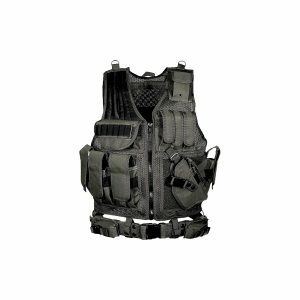 Whether you’re a hunter, paintball enthusiast or firearm trainer, both mobility and protection should be your top priorities when choosing the vest that’s right for you. 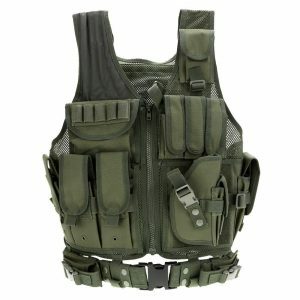 Tactical crossdraw vests. These a provide previously configured pouch layout but are not customizable. The greatest benefit of crossdraw vests are that they are already organized, which makes it perfect for first-time users. Chest rigs. A chest rig is just as adjustable as a plate carrier vest, but are substantially lighter. This allows for both greater precision and speed, but suffers from the drawback of limited storage space and decreased protection. Tactical vests are not designed to be a one size fits all unit – even though many are adjustable. Each experience you have will differ drastically, so the need to place additional ammo and at a quick reach is going to be a greater priority on the shooting range than it is on the paintball field. Larger vests with a lot of pockets can make both mobility tricky as well as be a hindrance. Pockets tend to get caught on the most random objects, and the first time user could easily find himself to be the laughingstock of the range as a result. You want to make certain that your vest is easy to put on and adjust to your body type, but you also want to make certain you can move with maximum efficiency. None of us thought tactical vests could be a part of daily civilian life. Most of us grew up watching SWAT teams and marines in movies and on TV. But once you begin to realize to realize just how useful and versatile they can be, it’ll be enough to turn you from a skeptic to a convert.